‘Waste not want not’ is a proverbial saying first recorded in 1772. Wilful waste makes woeful want is an even more alliterative version recorded earlier in 1576. These days it’s rare for any of us to have a ‘normal week”. Weeks zoom by leaving us to juggle a myriad of different curveballs while we await the elusive ‘normal….perfect….organised week’. Sorry to bust your bubble, but that week you just had? It’s probably pretty normal. We’re all flat out getting things done, let alone thinking about the foundation of our health: what we eat. We want cheap, quick and achievable. It will take some planning, we know that. But, planned or unplanned, some weeks can see us eating away from home so frequently, the food that we thoughtfully bought at the beginning of the week is now laying limp in the bottom of the fridge going to waste. It’s particularly frustrating for those of us who manage to get ourselves organised enough to do a weekly shop with a set amount of fresh produce. And if that produce is organic for some reason I feel like it is even sadder to waste it. 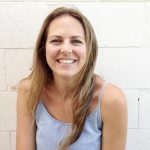 I switched to organic fruit and veg and cut out most processed foods when I found out I was pregnant with my first little cherub who is now four. I’m not a fanatic but I like to do what I can when I can and not feel guilty when I can’t. 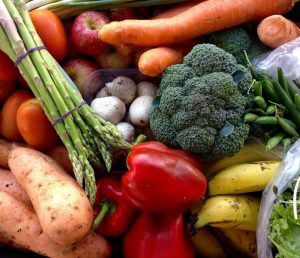 The cheapest way to buy organic fresh produce is to find a local seller who specialises in weekly or fortnightly boxes of organics. My go-to is A Life To Live- Affordable Organics (no this is not a sponsored post lol, just sharing trivia). ‘Waste not want not’ is the phrase that comes to mind. This proverbial saying was first recorded in 1772 but had an earlier, even more, alliterative version: wilful waste makes woeful want (1576). That said, we’re all keen to save time, save money and reduce waste in some way or another right? Left over fruit. You know those discarded pieces that are often left around if you have small children? Or odds and ends left over at the end of the week or the bottom of the lunch box? Ok, I’m being vulnerable here. Some of you will read this and think- yuck, Saving uneaten fruit?! Don’t be silly, it’s perfectly fine. Our spoilt Western mindsets see us waste good food. Particularly if it’s organic, who can afford to waste it? If it still looks good and provided you didn’t have to fish it out of the back of the lounge; chop it up and freeze it for later. My go to is a zip lock bag that I keep adding to. Perfect for an icy smoothie or added to a good Greek yoghurt. Apples can be chopped, frozen and added to a zip lock bag over time until you have enough pieces to make a quick, nutritious crumble. Bliss! 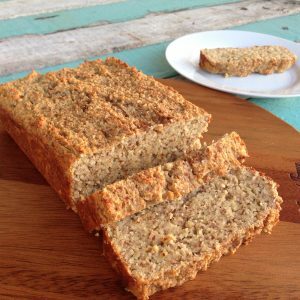 Bananas work in a banana cake or banana bread (my recipe is wheat, dairy and sugar-free) just as well as when they are fresh. Always take them out of their skin before freezing and don’t bother thawing before you use them or they’ll just go brown. The obvious one for frozen bananas is Banana smoothies too. For veggies that need using, make a large batch of nourishing soup. 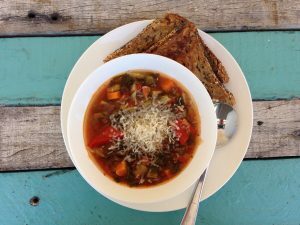 Perfect for the cooler months and a great go to lunch or quick dinner if you portion out in individual serves for the freezer. Most veggies work well- carrot and celery (stalks and leaves) are particularly yummy. But try stalks of broccoli, cauliflower, beans, corn, bok choy, potato, parsley and other herbs, just whatever you are wanting to use up and not see go to waste. For salad veggies, a quick way to use them up is to get a grater or a food processor and just use it to finely chop or grate veggies into a type of rainbow salad. Dress with a squeeze of lemon or lime, a drizzle of olive oil and a sprinkling of sea salt. For other bits and pieces: cut up odds and ends and use them to make an omelette or frittata. This is great for a quick breakfast on the run. Recipe below. 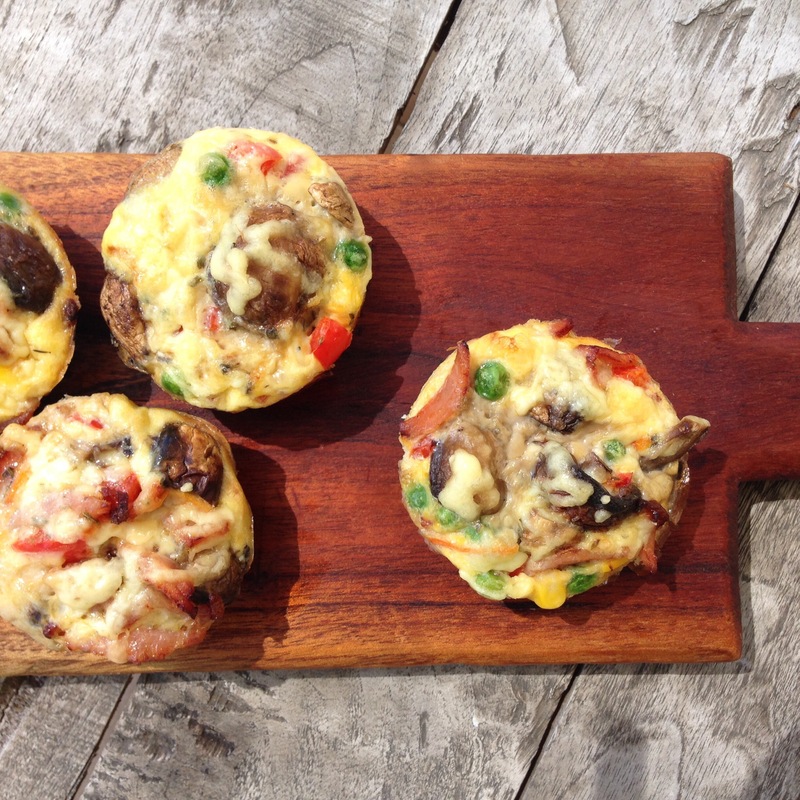 Grab some left over veggies (for the frittata below I used some tired mushrooms, uneaten peas, corn and capsicum) chopped up. Sprinkle some oregano, feta or tasty cheese and finely chopped and fried bacon. Pour over 6 eggs whisked together with 2 Tb of water (or cream, milk, whatever liquid you prefer). Add a little salt if you are not using bacon. Bake in the oven until set and starting to go golden. So yum! Perfect for brekky on the run. Easy to reheat the next day. And freezes well too. What’s not to love? Invest in clipseals. They keep anything in a pack fresher longer meaning you’ll be throwing out less. Storing things correctly also helps lengthen the shelf life. Airtight containers, zip lock bags, and your using your freezer are all easy ways to ensure you are wasting less food each week. Until next time, why not do yourself a favour and check out your local organic supplier? 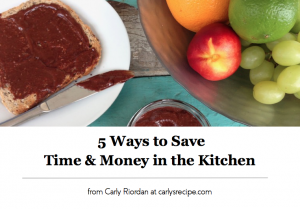 And I’d love to hear your tips for saving on kitchen waste. hare below. These are great tips Carly. I don’t like waste either so my mother in law has taught me a few easy ways to reuse leftovers that are just as delicious if not better than the original meal. Coming from a large family I have a habit of cooking in large batches so I always end up with heaps of leftovers. There’s only so many days you can eat the same meal over and over so one of my favourite ways to reuse the leftovers and change it up is to chuck portions into pastry making little pasties. I do this with leftover roast – meat, veg, gravy and all, curries, stir fries, anything really! That’s such a great idea Kelsi! We do this with our filling too: just freeze then cook pastry fresh.